Join us this Wednesday, March 4th, at Hobie Surf Shop in Dana Point!! 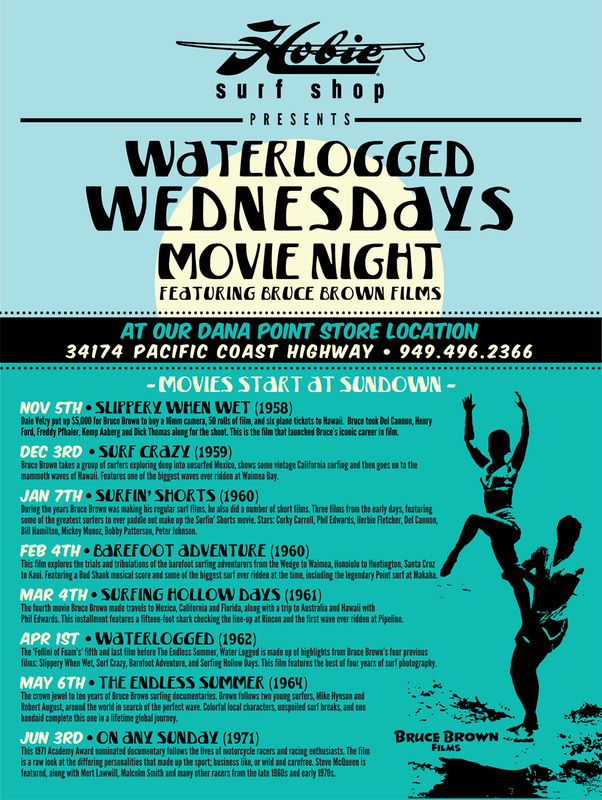 We are showing the whole movie as part of our ‘Waterlogged Wednesdays’ movie nights!! This film is a true classic. Bruce travels to Mexico, California, Florida, along with a trip to Australia and Hawaii with Phil Edwards. Hobie Alter is featured surfing his backyard break, Brooks Street in Laguna Beach. Don’t miss out. Bring your friends and family!! It’s a community event! Movie starts at 6:30pm and it’s FREE. Bring your beach chairs, blankets, snacks, drinks, ect.. We will have popcorn and treats too. Spread the word!!! We can’t wait to see you!!! Location :: Hobie Dana Point. 34174 Pacific Coast HWY. 92629. This entry was posted in General and tagged brooks street laguna beach, bruce brown, classic longboarding, Dana Point, hobie, Hobie Alter, Hobie Shop, Hobie surf, Hobie Surf Shop, Hobie Surfboards, longboard, movie night, surf movie, Surfing, surfing hollow days. Bookmark the permalink.